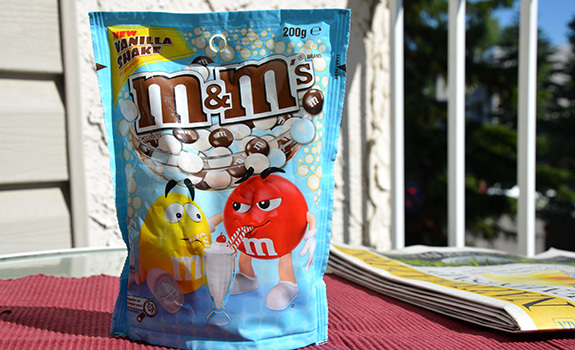 A bag of Vanilla Shake M&M’s from Australia enjoying some Calgary sunshine. Over the years, I’ve tried M&M’s in all sorts of flavours and formats. Plain, peanut, peanut butter, pretzel, mint, coconut … . A few weeks ago, I even sampled some orange-flavoured M&M’s from Australia. This week, we’re back to another M&M’s flavour from that kangaroo-infested corner of the globe. Vanilla Shake, they say? Interesting. I’m thinking it’ll taste like creamy milk chocolate with a hit of artificial vanilla extract, but who knows? I’m hoping for a pleasant surprise, like those blueberry-muffin-flavoured Mini-Wheats that actually tasted like blueberry muffins. 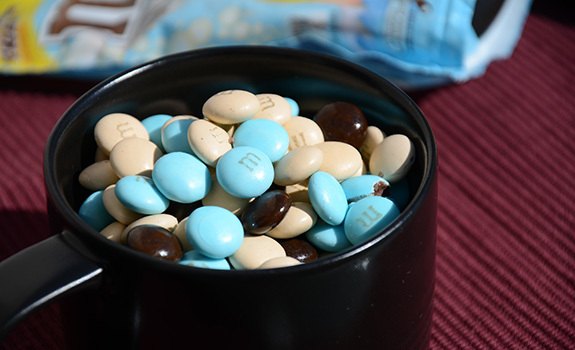 The Look: A blue and white bag with cartoon M&M’s characters sipping on a vanilla float with a cherry on top. The candies inside have pastel blue, beige and brown shells. The Taste: The vanilla is more vanilla-scented-candle than anything, though it works reasonably well with the creamy milk chocolate. There’s also a creamy note that does remind me of vanilla ice cream, so I guess it’s a successful flavour replica, if that counts for much. At least it isn’t an aggressive taste, meaning you can eat more of them before they become annoying. And that crunchy shell is, as always, a nice touch. Vanilla Shake M&M’s are pretty in a classic, conservative sort of way. They’re the colours I’d expect to see on a poodle skirt at a 1950s sock hop. Nutrition? : Per 25 grams (8 servings per package): 513 kJ (123 calories? ), 5.2 grams of fat, 15 mg of sodium, 1.2 grams of protein. The verdict: Not bad. But I don’t exactly feel like we’re missing out in Canada by not having these in our shops.